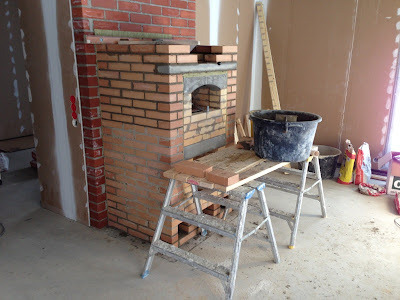 Today, 22nd February, it was time to put the oven on top of the fireplace. 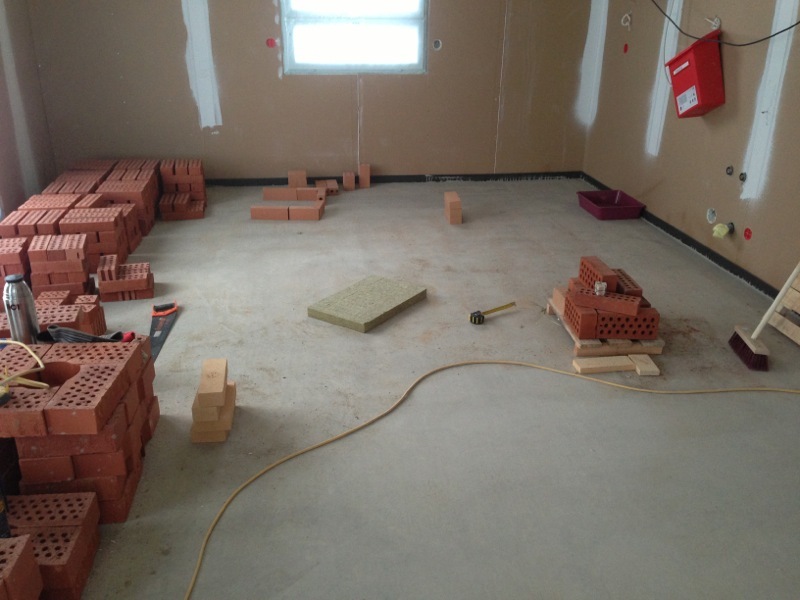 Again, the photo shows the state of the construction at lunch break. First layers 16 to 22 (including layer 21.5) of the heart were added. These include three large and very heavy concrete elements forming the roof of the oven. Then layer 22 of the frame was completed by adding a concrete bar spanning the front of the fireplace. Layers 23 and 24 were prepared. Here's a view into the oven. One can clearly see the arching ceiling made our of the concrete elements. The floor it made of four tiles, which simply lie on a bed of special sand. They are meant to be replaced after ten years or so. The hole in the front is for dropping ashes and embers into the fireplace below. This oven is heated by making a fire in the same cavity as the food is prepared in. Thus one first needs to heat up the oven, then wait for the fire to die, drop the embers, wait some half and hour more, than close the hatch on the ceiling of the oven (see next photo) an then put the food into the oven. Just looking at the picture above I can smell the food, and I'm getting hungry. Are you, too? Here you can see the oven from above. 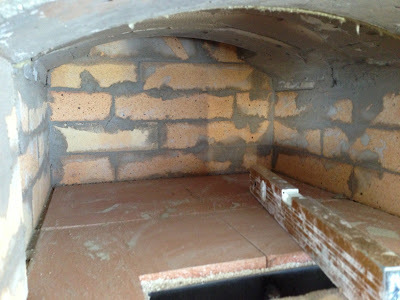 Again, clearly visible are the concrete arches making up the ceiling of the oven. The hatch for the exhaust, i.e. the connection of oven to chimney, is at the back. 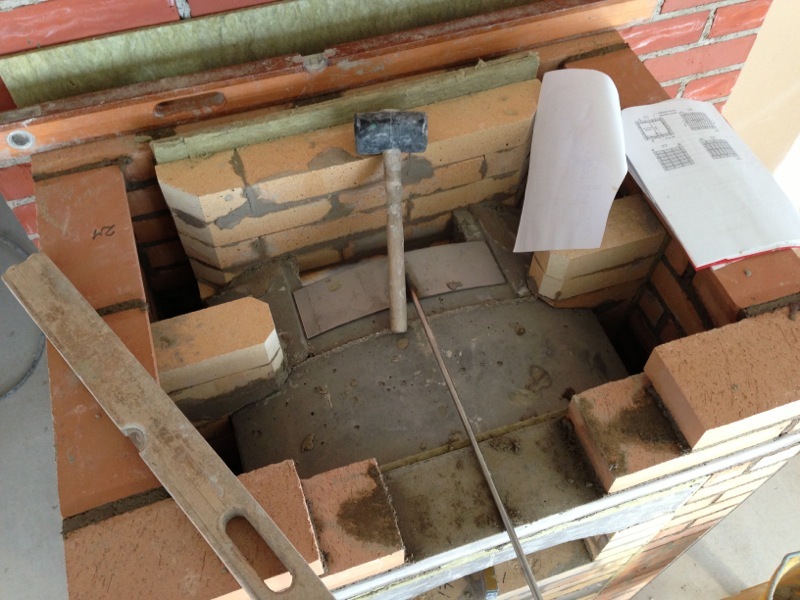 An arched metal panel is used to close the hatch, operated from the front of the fireplace by a long metal rod, which is conveniently placed at a height, where it simply exists through the mortar between two layers of the frame of the fireplace. At the end of the day, both heart and frame were completed. Now it looked almost like the final product, but a lot was still missing. 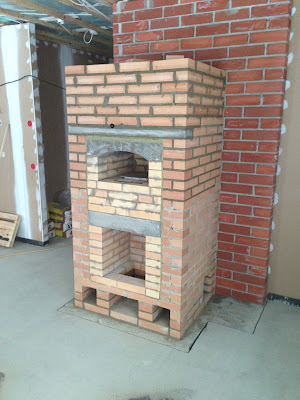 Next will come the chimney and the outer shell, then plaster, and finally paint – or maybe another layer of dyed plaster. Somehow the kitchen looks empty now, with most bricks gone. Still it is hard to imagine that all these bricks did – after all – fit into the small space the fireplace is taking up now.